Double denim is nothing new. It's not even old-then-new-again anymore. I think this trend has resurfaced for long enough that it's no longer even considered a trend; it's just another option for wearing denim. I've doubled up my denim enough times that I hesitated to even blog this look today. However, although the key pieces (chambray shirt and dark wash jeans) remain the same, they're so versatile that they continue to look fresh even in their repetition. In my opinion, the key to making double denim look more polished is by tucking in my shirt and adding a belt. Since it's winter and I'm constantly cold, I'm adding my cozy gray cardigan for warmth, plus I think it adds interest to the look. To me, double denim is a great blank canvas, perfect for adding fun accessories and layers. What's your favorite "trend" that's been around for a while? This is a very put-together, casual mom outfit. I love it. Great cardigan and booties and your pop of leopard is spot-on (no pun intended)! Have a Great Valentine's, Shea! Thanks Ada! Ha, I love the leopard pun :) I hope you have a great Valentine's Day too! Thanks Amy, it was nice and cozy! Thanks Alexandra! This cardigan is really cozy--it's like a big blanket :) I'm also a fan of leopard accents (obviously) and pearls. I never get tired of pearls! I just tried this for the first time, I'm only sort of ok with how mine turned out. I really like the various ways you've styled double denim, I think you've used the right amount of accents and contrasts to make it work really well. I'll be trying something more like your various outfits the next time I style double denim I think! Thanks Beth! I've definitely worn it some ways I like better than others. Even though I've seen other people pull off the double denim in similar shades (and I've tried it myself), for me I like the contrast of the light and dark. I love the addition of the cardigan. It does look so cozy! I love all of the blues together! I suppose some trends to transcend 'trendiness' and double denim is great regardless. So many options! I think you're right--I love all the options it gives! Tucking in the shirt and adding the leopard belt really does add polish and your black canvas for adding accessories is the perfect description. I like all of those looks and you really know how to double up the denim. Thanks Megan! So my excuse for wearing (and blogging) basically the same outfit over again totally worked :) Thank goodness for accessories! I wish I could pull this look off but I never seem to get it right! I'm sure you could make it look fantastic Krysten! 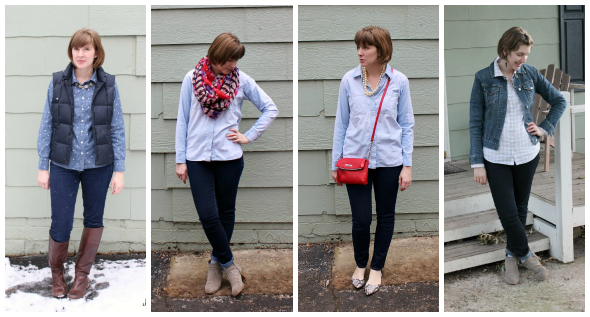 I love the double denim looks with high contrast between the two washes. I grew up in a small hicktown in the 80/90s, so I've always been wary of double denim outfits, but these look great! Thanks Cara! I agree, I usually go for a light/dark contrast too, it makes it feel more modern to me. I love this look. You look amazing! I love your polka dot top! super cute outfit! I love your polka dot shirt! super cute look! That vest looks so pretty with the top :) The hint of snowdrops made the photo look really lovely too! By the way, I'd like for you to come over to my blog to see my latest. You are rocking that vest!